You’ll either be running around like a chicken with its head cut off or standing on hard concrete most of the time. Nice, trendy, sneakers will be your best friend. Girls, pack your heels in a backpack so that you can still rock them when needed. Is this what menopause feels like? Dress in layers that are easy to remove so that you can take them off when sprinting between classes and then put them back on for a more professional look when at the booth. Wear something that makes you stand out! Fashion is a great conversation starter. I know Halloween is around the corner, but just don’t wear something too out of the box. Many conferences offer classes. I highly suggest registering for them before you get to the conference. It gives you more time to relax and get your footing when you first get there. Also, register for more classes than you think you’ll attend. Check to make sure there’s no penalty for missing classes. There typically isn’t a penalty for missing classes. So, might as well register for them all! Print or take screen shots on your phone of the agenda and conference map. This prep pays off when you’re zooming from place to place trying to figure out where you’re supposed to be and how to get there without getting lost. Not real juice. Chargers! I highly suggest bringing your phone, computer, hover board—whatever chargers you may need—with you. Now here is where you can bring real juice. Pack some snacks and drinks for the day. Most conferences have a designated lunch time. Be sure to take advantage of it. The day can go by fast, and if you’re like me, I get caught up in conference activities. Also, if you get “hangry,” pack some snacks. It helps not only you, but may save the sanity of the rest of your team. Taking notes at the conference is a great way to bring your newly acquired knowledge home. Pack some extra paper and pens because the people around you most likely didn’t read this helpful blog and will be sad when they can’t take notes like you. Who knows? Maybe the sad, pen-less person next to you will be a great addition to your network! And if you’re the paperless, take-all-my-notes-on-a-tablet type, well pack them anyway and refer to the previous sentence. I pack whatever I think I may possibly need. My typical go-to list of “anything else”looks something like this: plenty of business cards, gum, chap stick, headphones, book/ipad, etc. Now that you know what to bring, stuff it all in a backpack. You may think this sounds silly or like your first day of college all over again, but the majority of people will be rocking the mom-at-the-zoo-frazzled-but-excited look. They will be wishing they looked as cool, calm and prepared as you. Just embrace the backpack. You won’t regret it. Hand out business cards and exchange contact information as much as possible. You never know who you may run into or when a person in the room has a business problem you can solve. Go beyond the surface level and learn what you have in common. Maybe they also have a super cute pit bull-boxer puppy, live near where you do or attended the same college. Similarly, once you start talking, you may find common professional goals and challenges that can lead to your next new skill or maybe your company’s next sale. Take a break by spending some time alone in the room or simply take a mid-day nap. Get away from the conference atmosphere for a few minutes and let your brain recharge. Maybe get out with your new-found BFF from mingling? Water is important, but also have a beer (or drink of choice) and relax with coworkers. Many conferences offer an open bar or drink tickets. Enjoy the perks of adulthood. Just don’t get too excited. After all, you are a professional, and this is your first rodeo. Go to bed. Do not try to hang with the cool kids and deprive yourself of badly needed sleep. No one likes a grumpy, hungover, booth bum on the last day of the conference. 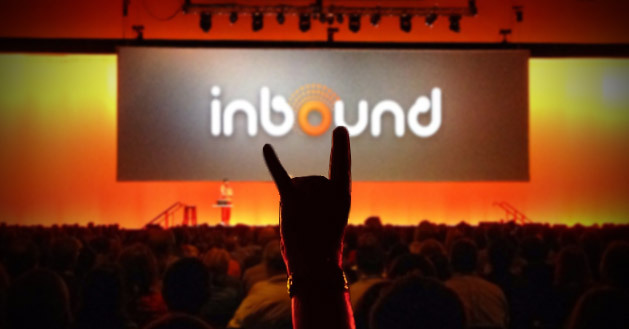 Next week I’ll be attending my second INBOUND conference. I have to go now and buy my snacks and pack my backpack. Hit me up on Twitter or Instagram, and let me know how these tips work for you!